THE CITGO BRAND IS BACK! Citgo has launched a new brand image and with it new programs to allow for their brand to grow in markets as competitive as New Jersey. Citgo's new brand is a BRIGHT, NEW & CLEAN image that is inviting to consumers and Dealers alike. Along with this new image, Citgo has become aggressive in the New Jersey market looking for immediate growth. They have introduced new programs to help their dealers remain competitive. They understand the competitive nature of the unbranded competition in New Jersey and are prepared to compete! If you are in a very competitive market with several unbranded stations, Citgo can help you stand out. Prestige Petroleum is very aggressively branding stations in New Jersey Citgo and would like to evaluate your station to determine if Citgo is the answer! 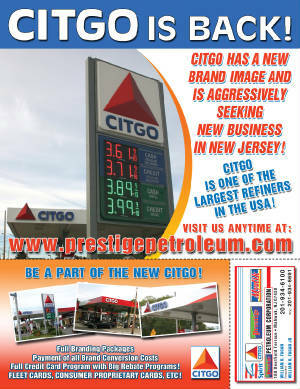 Click here to have Prestige Petroleum contact you about CITGO!